“Laughter helps us get through life’s challenges,” said Kueny, wearing a jester hat and a laughter yoga jersey. “It has lots of great benefits. It helps to improve social connections. If you laugh with people, you instantly form a bond. And happy people are easier to get along with.” Mike Kueny has suffered from depression for 10 years but he still laughs nearly nonstop for 45 minutes every Sunday. This entry was posted in Laughter News and tagged breathing exercises, center for conscious living, chronic stressors, Dean Health System, floor rotunda, gibberish, Helen Stoneman, jester hat, joke, jokes, laugh, laughing gas, laughter club, laughter yoga, Lisa Rambaldo, madan kataria, madison group, Madison Laughter Club, Mike Kueny, Sharon Bartosch, social connections, uproarious laughter, world laughter day on June 3, 2010 by Sebastien Gendry. 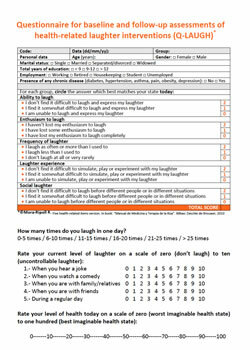 News: Australians Say We Love Laughter Yoga! Sydney, Australia: I walked into my first laughter yoga class expecting to see a hippie in a tie dyed shirt and leggings. I did not expect my yoga teacher to be a lawyer. And I certainly didn’t expect to be rolling around on the floor laughing with a bunch of people I’d never met before. But that’s exactly what happened. This entry was posted in Laughter News and tagged amazing things, benefits of laughter, breathing exercises, children laugh, humor, joke, jokes, laugh, laughter club, laughter clubs, laughter yoga, love, madan kataria, merriment, mirth, yoga class, yoga international, yoga teacher on May 26, 2010 by Sebastien Gendry. This is a nervous stand-up comedian’s dream audience. Not only will they laugh at anything, apparently they will also laugh at absolutely nothing. 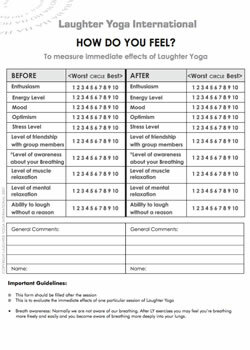 Laughter yoga, yes seriously, has become a popular stressbuster worldwide. It originated in Mumbai with Dr Madan Kataria who combined breathing exercises from yoga with laughter. The premise is that laughter — spontaneous or contrived — releases endorphins in the body that relieve anxiety. This entry was posted in Laughter News and tagged anxiety, best medicine, breathing exercises, cnn asia, gateway of india, laughter yoga, madan kataria, saying about laughter, smile, stand up comedian, stressbuster, stretching exercises on April 19, 2010 by Sebastien Gendry.